SuperAttic™ Attic Insulation in Eastern SC! Contact us today for a Free Quote to have this unique attic insulation installation in Myrtle Beach, Charleston, Sumter, and areas including Florence, Bluffton, North Charleston, Mount Pleasant, Beaufort, Goose Creek, Darlington, and more. If more than two of the statements above apply to you and your house, a SuperAttic system could be a smart investment. Contact us today for your Free Quote for attic insulation in Sumter, Myrtle Beach, Charleston, and nearby areas. 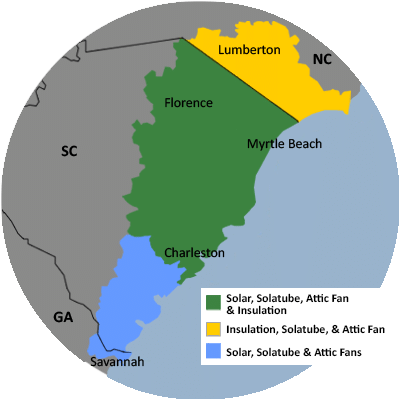 Call 1-855-410-0662 or contact us online to schedule a Free Quote for SuperAttic home insulation in Sumter, Charleston, Myrtle Beach, and neighboring areas such as Mount Pleasant, Florence, Bluffton, Darlington, Beaufort, Goose Creek, North Charleston, and more.